This picture was taken years ago. I think, during the Christmas season. 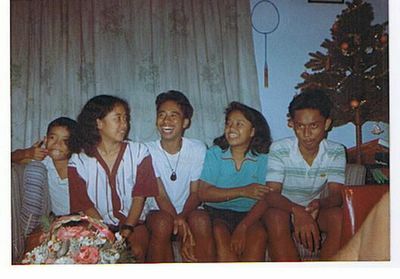 From the leftmost part of the picture is our youngest brother Lucky (Louis Rafael), beside him is Ate Do (Doreen, the grimwitch), Toto, (Leo Rafael), me, and Lloyd. Every New Year, ever since I got married, we take a new picture spoofing this old one. It's nice to see how we've changed. Di ko pa nakikita grades ko!